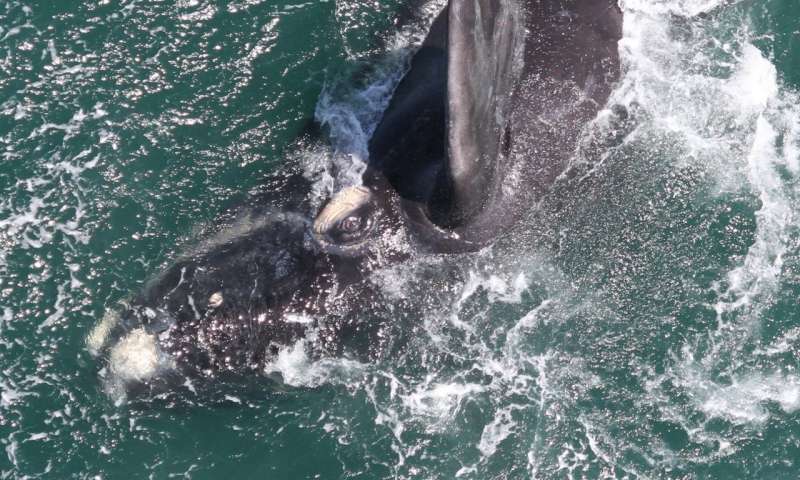 A comprehensive aerial survey of whales and dolphins off the coast of South Africa supported by a range of organisations including Fauna & Flora International (FFI) has recorded an astounding 1,106 southern right whales, including 536 calves, an all-time record. 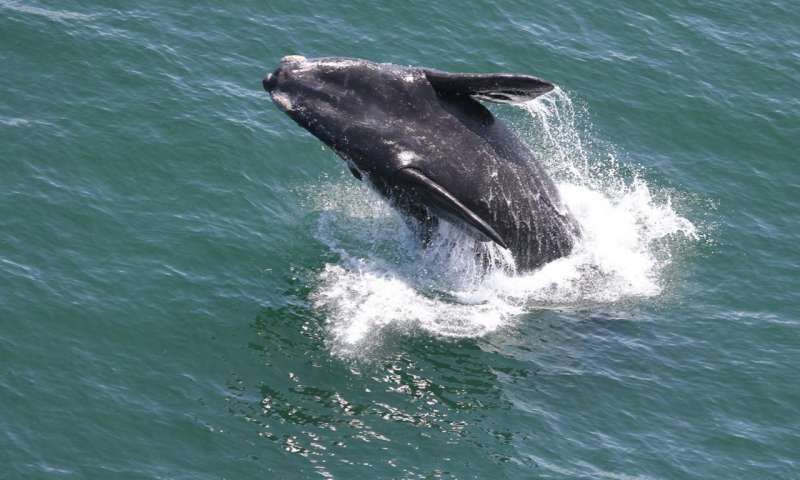 Now in its 39th year, South Africa's annual survey of southern right whales and other cetaceans is conducted by the Whale Unit at the University of Pretoria's Mammal Research Institute. Spread over an eight-day period in early October, this year's survey involved over 36 hours of flying time, during which an eye-watering 20,000 photographs were taken – many of them while hanging (securely) out of a helicopter. The survey team recorded every whale and dolphin species encountered, but focused specifically on southern right whales, counting every individual along the stretch of coastline from Nature's Valley to Muizenberg. Photographs were taken of every female accompanied by a calf (each whale can be identified by the unique pattern of callouses on its head). Over the coming months, these images will be analysed with the aid of a computer-assisted image recognition system and cross-referenced with the Whale Unit's existing catalogue of southern right whales, which comprises visual data on over 2,000 recognisable adults recorded during the previous 38 surveys. The number of southern right whale calves recorded along the South African coastline represents an all-time high, and a remarkable increase compared with the previous three surveys, which yielded 249, 55 and 183 cow-calf pairs in 2015, 2016 and 2017 respectively. In stark contrast, the number of so-called unaccompanied adults – just 34 in this instance – remains extremely low. According to Dr Els Vermeulen, Research Manager at the Whale Unit and leader of the survey team, this suggests that adult male and non-calving female right whales are not migrating as far north as the South African coast – or mating in the area – as they did prior to 2009. "Whether this is a temporary trend or not, remains to be determined," stated Dr Vermeulen. "We are currently investigating this matter, with preliminary results indicating strong links with climate conditions in the Southern Ocean and fluctuations in food availability. Similar trends are being recorded in South America and Australia." 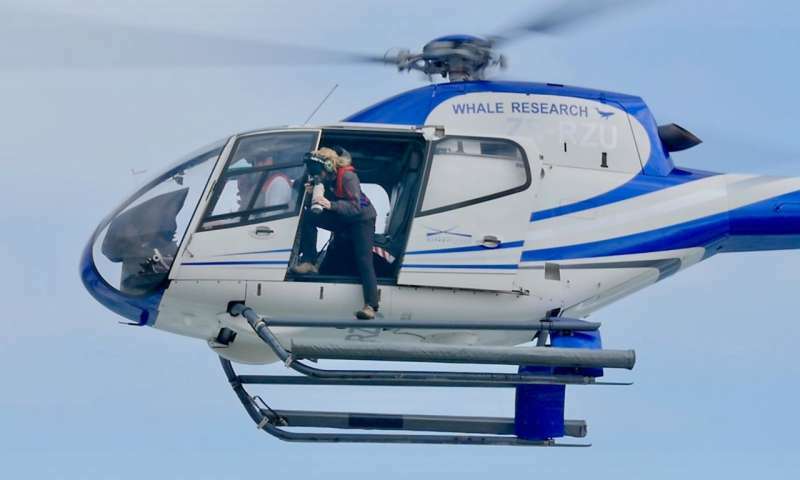 Dr Vermeulen's team had been made aware that this year's southern right whale count might require more resources due to the imminent arrival of a superpod, hence the urgent need for additional funding to support a more protracted survey period that would leave no individual unrecorded. The survey data will be used to inform a wider, long-term project that aims to track the health and well-being of right whales in the Southern Ocean. Analysis of the imagery will enable Dr Vermeulen and her team to work out which females calved this year, and accurately monitor individual distribution, movement patterns and reproductive success. The South African population of right whales has been increasing at an estimated annual rate of 6.5% since the survey began, largely due to the greater international protection afforded to these magnificent marine mammals in recent decades. However, their recovery appears to have stalled in the last few years, so there is no room for complacency. As Dr Vermeulen points out, continual monitoring plays a crucial role in ensuring a future for the southern right whale: "The analyses will allow us to investigate further possible causes and consequences of the concerning decrease in sightings along our shores in recent years, and the huge increased presence of calves recorded this year."